When we bought our 1904 house we inherited a monster of a heating system. Steam radiators in every room, and when we moved in it didn’t work well — lots of banging, some radiators didn’t heat up at all, and the energy bill was EXPENSIVE. Worse, the temperature set on the thermostat didn’t seem connected to what happened in the house. On top of it all, this was some kind of system that none of our contractors were familiar with. They would arrive and stare at the fittings and you could see a kind of doubting look come into their faces even though they tried to conceal it. For a while we paid them to adjust things that didn’t need adjusting and add things that didn’t need to be added. The system didn’t work any better. Finally I got down to business. 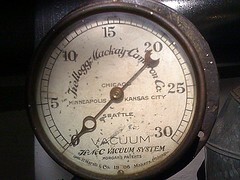 By examining this antique gauge (which appears to measure a vacuum in bars of mercury) I figured out that I had a Kellogg-Mackay-Cameron Co. Vacuum System installed in 1906, based on Morgan’s patent. I managed to find the original product literature [PDF] on a steam heating enthusiast web site. I found the original patent on Google Patents. Heady with this success, I thought — why not look for the original repair instructions that would be written for the steamfitters of the day? I found the book 500 Plain Answers to Direct Questions on Steam, Hot Water, Vapor, and Vacuum Heating (1915) on Google Books. A steam system is like a child’s mobile. When you touch one part, everything else starts swaying. If you’re not sure what will happen when you touch something, don’t touch it. My system now produces a cozy, dry heat that my allergist says is far superior to forced air. It’s much quieter. My heating bill dropped substantially (it is lower than an equivalent forced air system would be in my house, but the maintenance cost is higher for the steam system). While steam radiators have a reputation for being trouble-prone heating systems, in fact the main problem is that nearly everyone that knows how to build, operate, and maintain one is dead. And what craft! My system is 100 years old and works very well. As I learned from Holohan’s writing, it is quite common to encounter parts of these systems that no one alive understands and (until recently) weren’t documented anywhere. If that knowledge were more widespread and steamfitters (and spare parts) were as common as they once were I think steam would rule the world. I guess this is another case study in path-dependence. Pick up The Lost Art of Steam Heating and you won’t be disappointed. This book is worth buying for Dan’s chronicles of famous boiler explosions alone. This entry was posted on Thursday, October 15th, 2009 at 2:34 pm	and is filed under Living. Thanks for the wonderful story. You made my day! What a neat story! This is so cool. Thanks for sharing. Thanks for the link to the flikr page. I see a lot of systems and this is first time I saw this. No wonder the service techs were scratching there heads. This points to a problem in any industry. If you don’t know something, say so and leave well enough alone. Some of those guys were doing there best to provide a service, I am sure motivation by a mix of dollars and a desire to satisfy you. You provided the only solution because you are motivated, willing to spend the time, smart and possess an analytical mind. Also, Dan’s site is the best. I read this because he linked it in his newsletter. Sign up! Also, tell the service techs about this blog and heatinghelp.com Thanks again. Excellent! I work at Montana State University that has some very old equipment and heating systems (single pipe). I did purchase the Lost Art of Steam and a chapter in the book led us to solving an age old heating problem in a gym that was built in 1922. The price of the books (we bought two) paid for itself instantly. I have worked on these very systems for 40 years. Most techs today do not have a clue & a large majority of them arent interested in learning about them. Vapor systems where the cats meow of the day !! Glad that I learned from all the dead men, & they really knew thier trade !! G- luck !! Help, one of the radiators from our faithful steam system has started to produce a rotten egg smell. Does anyone know what this is or better yet, how to fix?